If you or someone you love has been injured on a snowmobile due to the negligence of someone, contact our Salt Lake City snowmobile accident attorney at Jardine Law Offices, PC is here to help you get the compensation you deserve. Winter can be really hard for people. The days are shorter and the weather gets colder. It doesn’t leave most of us motivated to run outside and do errands. Instead, people are more likely to stay inside and carb load on winter favorites. However, there are the few that go absolutely nuts for winter. This is because these people love a good snowfall. Our Salt Lake City Snowmobile Accident Attorneys at Jardine Law Offices, PC is here to tell you that we get just as psyched about snow season too. We love watching our loved ones shred the slopes and enjoy a snowmobile ride through frosty mother nature. However, we are also very cautious and encourage you to be cautious too. Accidents can happen; even to those who have the most expertise. Snowmobiles are the four wheelers of the world. Just, instead of riding on land you are riding on top of the snow. The machine lets you travel to far off distances without using skis or snowboards. Snowmobiles are vehicles that expand your adventure, but they can also be the cause of your tragedy. Snowmobiles should be ridden by people who are familiar with the machine and who know the terrain. Of course, that isn’t always the case. When you choose to ride a snowmobile you are agreeing to a certain level of risk. This level of risk was taken by a man who was injured while riding. This past February, a man rode a snowmobile through the Mineral Basin area toward American Fork Canyon. What started as a normal ride became a near fatality. The rider hit some sort of wall, authorities are still unsure if it was a wall of snow or rocks, which resulted in him hurting his back and breaking his leg. As LifeFlight was near to his area, they kept circling because the clouds were too low to land safely. Thankfully there were other rescuers who took the injured to a safer location. Accidents can turn fatal quickly because of a 600-lb. machine that can reach up to 90 mph, The snow is not as powder soft when you are hitting it with great speed. 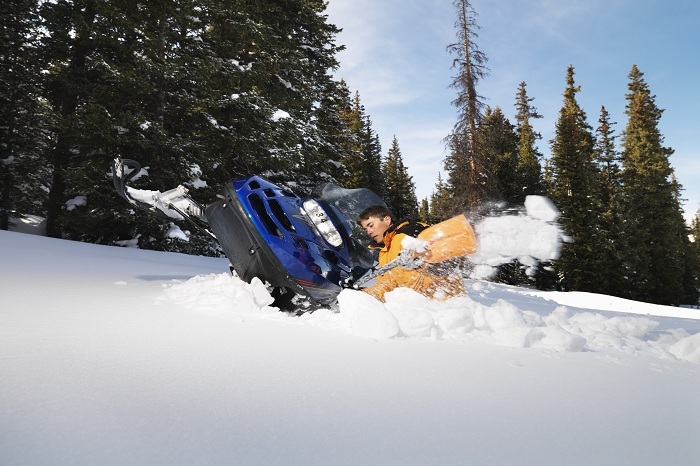 It is reported that speed, alcohol, inexperienced driving, and poor judgment are leading causes of injury on snowmobiles. If you or someone you love has been injured on a snowmobile due to the negligence of someone or the malfunctioning of the equipment then our Salt Lake City Snowmobile Accident Attorneys at Jardine Law Offices, PC are here to help you get the compensation you deserve. Any kind of injury means two things: lots of medical bills and lack of income. You need help and we are ready to get it for you. Call 801-350-3506 or click here for a free consultation with our professional attorneys at Jardine Law Offices, PC today.